Welcome, traveler. 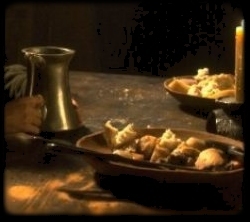 You have found your way to The Burping Troll, the most remarkable tavern in all of united Gondor and Arnor. Here may be found Elves and Hobbits, Dwarves and Men, Rangers and the occasional Orc or Wizard. There's even the Balrog tending bar over there - but never mind him, he has to be relit half the time, anyhow. Just pull up a chair, shout for whatever your favorite poison may be, and listen to our tales of adventure in Middle Earth. Here are the ongoing collaborative works of a gathering of writers and dreamers, who base our stories from this way-station for weary travelers and jumping-off place for many adventures. Whether you seek danger, drama, laughter, romance or riddles, they are all here.